Hornbills are the farmers of the forest. They are large, fruit-eating birds which live in sub-tropical forests of Asia and Africa. Because of their ability to commute over long distances, they are of extreme importance for the dispersal of seeds and therefore for plant reproduction. However, large forested areas are needed to sustain hornbill populations. As a consequence of intense habitat destruction, many hornbill species in south-east Asia have been dramatically declining. 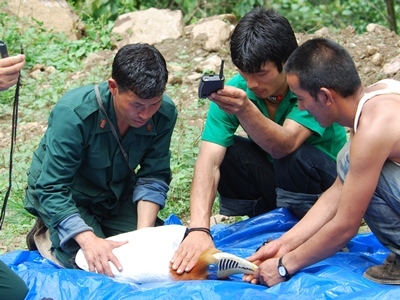 By deploying state-of-art telemetry technology we will study the movement ecology of rufous-necked hornbills (VU) in Bhutan, where threat to habitat integrity is becoming a growing concern with increase in tourism and foreign investments in infrastructure. The purpose of our study is to link hornbill movements to habitat characteristics and connectivity, to highlight the importance of this species for the ecosystem function. Furthermore, since hornbills consume and spread seeds of fruit species important for the economy and culture of local communities, a major focus of our project is to underline the benefits for the Bhutanese people of protecting hornbills and the habitat where they thrive.